Though no one died, dozens of people in the Chicagoland area had very high blood-alcohol levels following the premiere of "Bad Universe." 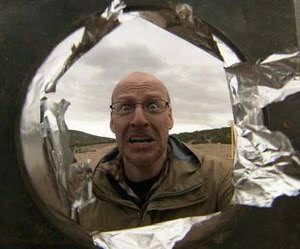 “Bad Universe” is a new Discovery Channel program hosted by Phil Plait, “The Bad Astronomer.” The mini-series discusses astroid collisions, black holes, and alien invasions. Supporters of the show say it provide a humorous vehicle for Plait to promote astronomy. Critics say it suffers from too many explosions, and from Plait’s desperate attempt to come up with a catch phrase. These flaws formed the basis of the “Bad Universe” drinking game. Participants have to drink whenever there’s an explosion, Plait asks to “press the button,” and every time he says his catch phrase. Paula, a Bolingbrook resident, says the game ruined her “Bad Universe” party. According to her, things got out of hand 45 minutes into the party. David, a Downers Grove resident, said his party came to an early end, thanks to the drinking game. “I don’t drink, so I didn’t play.” Said David. “When I game out of the bathroom, my bud was passed out on the floor. I didn’t think much about it, so I drew an astroid on his forehead. After I noticed that everyone was passed out, I called 911. Good things my friends survived. Now we can laugh about this. When The Babbler tried to call Plait’s cell phone, his wife answered. She urged all fans to drink responsibility when episode 2 debuts. She added that Plait was interviewing the President about science for a future episode of the show. Future episodes, she said, would be discuss serious issues while still being accessible to the public. He needs to drop his 'Holy whatever' catch phrase - I'm not going to be able to put up with that long term; drinking or not!